service create name="test" where path = "C:\Users\msi\Desktop\SampleService.exe"
Hint: <assignlist> = <propertyname>=<propertyvalue> [, <assignlist>]. How can i create a service with wmic.exe tool? I believe the answer is that wmic cannot create a new system service. The list of properties has included every possible argument that a system service would require, all marked as "N/A", meaning "Not Applicable". I have also searched on google for "wmic service create", and found a paltry four answers, but none of them was related to creating a service. I think that you will need to resort to another tool than wmic. For example, PowerShell documentation includes the applet New-Service. 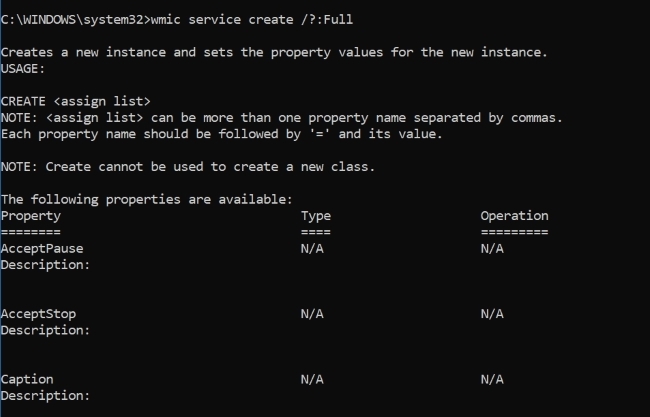 WMI itself includes such a method in Create method of the Win32_Service class, but you will need to call it via other method than wmic. Not the answer you're looking for? Browse other questions tagged services wmic or ask your own question. How can I start a service on a remote machine using a different user? How to add a compiled ntpd in services on linux? How do I set permissions / specify which users can interact with “Session 0” on Windows Server 2008R2?